Mango is undoubtedly the King of fruits, at least for me, and I bet several others would agree with me on this one! With a beautiful color, rich creamy pulp and unbeatable taste, mangoes hold a special place in every recipe. Though they are great to just consume by themselves, they do add a special touch to the food they are paired with, especially desserts. So here's a household favorite - rich creamy Mango Ice Cream, made without using an ice cream maker! And I add a hint of Cardamom to the recipe, which is a taste I developed after trying it for my Peach Melba with Vanilla Cardamom Ice Cream recipe. The Condensed milk is indeed the second star ingredient which lends the smooth texture to this ice cream. Back when I was a young kid in India, helping my mom in the kitchen we did not have the convenience of fancy kitchen gadgets. It was hard to find a proper baking oven in most homes, as some of you might recollect, so having an Ice Cream Maker was definitely not treated as a valid expense! :) But that does not mean we did not get to enjoy creamy dense ice cream at home - it just meant you had to add in a few extra steps to develop that smooth velvety texture, and this Mango Ice Cream is proof that you don't always need gadgets to do things right! Boil the milk till it becomes a little thick and creamy, about 12-15 mins, then remove from flame and add condensed milk to it. Allow the milk to cool to room temperature. Meanwhile, de-seed the mangoes and blend the pulp in a mixer to make thick mango pulp. Do not add water or any other liquid. Once the milk is cool, add the mango pulp to it and blend well. Check for taste and add more sugar, if needed. Now transfer the mixture to an ice cream pan; cover it with cling-wrap, then put an inverted baking dish over it, to prevent ice from forming on the top of the pan. Freeze the mixture for a couple hours. Remove the mixture and transfer to a mixer again. Add the cardamom powder and vanilla essence, then blend well, using the Whisk/Froth setting on the Blender. Again freeze it for an hour, then repeat the blending process again, one more time. This may sound strenuous, but it is what you need to do when you are not using the convenience of an Ice Cream maker! But don't worry, its totally worth it - the freezing/churning process will ensure that your ice cream becomes nice and creamy, and sets well to give you same texture as an ice-cream maker recipe. Now put the ice cream pan in the freezer, again, covered with cling-wrap and freeze for another 3-4 hours, or until ready to serve. When you want to serve it, remove the pan from the freezer and let it thaw for 5 minutes. Then take an ice cream scooper and dish out as many scoops as you like in a bowl. Garnish with some fresh fruit and mint leaves, more mango pieces if you like, and serve immediately. You can also use pistachios or other fresh fruit like berries as a topping. Love the colour on the ice cream. Doesn't look artificial like the store-bought ones. And pretty simple too! Mansi this sounds interesting. never tried ice cream with condensed milk. Makes me feel refreshing for this summer. I have never made ice cream before because I didn't want to commit that much of my storage space to an ice cream maker which I would rarely use. I plan to try this recipe. It sounds and looks delicious. Thanks for sharing. Thankx Mansi for sharing the recipe... It is a perfect refreshment for the summer... will surely try this out!! Nice dessert. Thanks for the idea of adding condensed milk to ice cream. This looks so delicious! I cannot recall ever using cardamom before! One question though...what is an ice cream pan? ice cream pan would be just like a normal cake pan, but preferably white aluminum or tin pan, as it will create less frost. And a thin base would be better than a heavy-bottomed one. Wow!!! Mansi..bookmarked..luv to try this mango ice cream. MMMMM, Ice Cream and Condensed Milk, My favourites!!! Looks delicious! Sorry but would the result be disastrous if we used canned mango pulp from Indian stores? This looks like the perfect ice cream for a hot summer day! I really enjoy making something new with mangoes coz I love it a lot. I love homemade ice creams compared to ready made ice creams. I will try this! I love homemade ice creams compared to ready made ice creams. I will try this, thanx for the share. Yummy, Ice cream pan would be just like a normal cake pan, but preferably white aluminum or tin pan, as it will create less frost. Thanx for posting. Hmm so that you don't have to compromise on the consistency. Anyways the canned pulp will have more essence, so you don't need to use the whole can. thanx for the post. I didn't want to commit that much of my storage space to an ice cream maker which I would rarely use. I plan to try this recipe. It sounds and looks delicious. Thanks for sharing. Well, It is a perfect refreshment for the summer... will surely try this out!! keep it up. Interesting. I do enjoy reading your blog and your recipe is good. I might apply cooking that this coming weekend.Thank you for sharing your recipe and you blog post. I think that you don't have to compromise on the consistency. Anyways the canned pulp will have more essence, so you don't need to use the whole can, thanx for the share. The color of the ice cream really gets my attention! 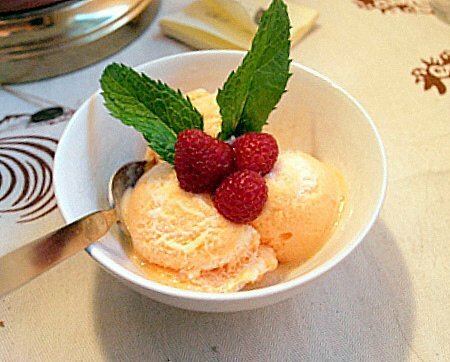 I love the mango flavored ice cream but never tried a home made ice cream. I'm going to make one at home. Thanks. Keep on posting. This is the smoothest sorbet I have ever had. I used canned mango drained off the syrup as I didn't have any fresh when I found this recipe.Everyone who has had a taste was impressed...Thanks for sharing!!! I love ice cream one of my favorite foods thanks for the new tips i love it.. Worked perfectly in my old timey ice cream maker. So easy and simple, I thougth it was too good to be true. I have 6 kids and it was an instant hit! I can't wait to use this as the base recipe for other variations. Hmmm, I'm going to make one at home. Thanks, Keep on posting, looking forward. A wonderful refreshing summer treat. I added a bit of citrus vodka to keep the sorbet texture after freezing. A classic treat. Mango ice cream. Yum! I have been doing that since I was young, I even double it up with chocolate syrup. And I still can't get enough of it.